Soup with vegetables in the starring role is my favourite winter lunch. To empty the crisper draw of the week’s leftovers before I visit the Farmer’s Market, I make my house specialty, aptly named “bottom of the fridge soup.” My mood is fickle so sometimes I simply dice the vegies and cook them in water so they make a tasty vegetable broth or alternatively I puree the cooked veg with a little milk or cream. Occasionally the result is a show stopper. Allow me to introduce my latest success, creamy winter vegetable soup with toasted cumin, brown rice and chard. Put the prepared vegetables, water and stock cube into a large saucepan. Bring the pot to the boil, then reduce the heat and simmer until the vegetables are soft, about 20 minutes. Use a stick blender to puree the vegetables adding extra water if necessary to correct the consistency. Stir in the cumin, then season to taste with sea salt and freshly ground pepper. Stir in the chopped chard and cooked rice. Return the pot to the heat, return to the boil and simmer the soup for 5 minutes. Stir in the milk and cream. 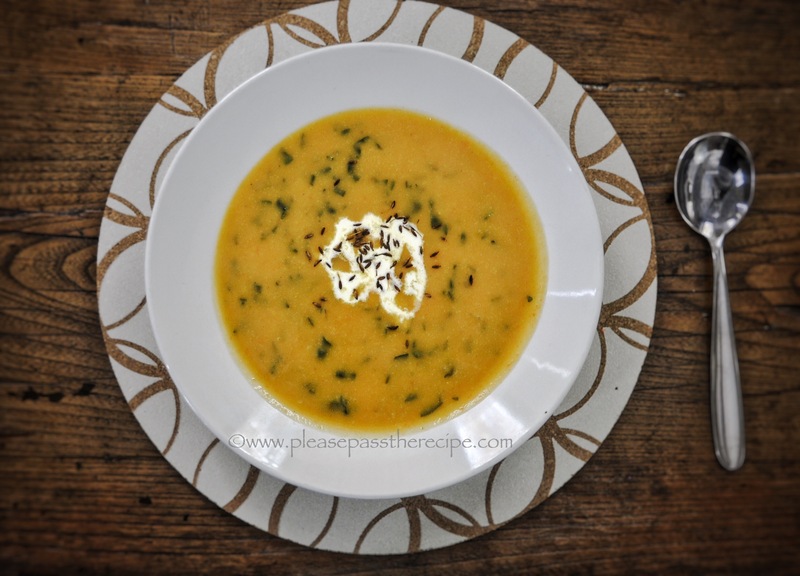 Serve the soup garnished with a little cream and a sprinkle of toasted cumin seeds. Gosh this sounds so good Sandra! This is something I should learn to do each week before visiting the farmer’s market too. Also love the idea of adding in some brown rice to add to the heartiness. Sandra if this is a bottom-of-the-fridge soup, I tilt my hat to you. Looks like a top shelf soup to me! Yum! Love the sprinkling of toasted cumin seeds – I usually stir those babies through. Love the idea of using them as a textural topping. Well, the brown rice which I always have in my fridge + the cumin that thankfully we all are using more really make this soup and can’t wait to make it ‘just thus’ 🙂 ! Hope the choosing and packing are going OK!! Lovely addition of the rice. Soup season rocks. Sounds delicious!! I love cumin in this kind of dishes, it really lift the flavour up! Sandra, this sounds absolutely delicious. I love using chard in soups, but your version is different from anything I’ve ever made: I love that you added rice for more heartiness and creaminess, and the spices on top make it even more special. This entry was posted on July 14, 2015 by ladyredspecs in FODMAP diet, Food, Gluten Free, Light Savoury Dishes, Soup, Vegetarian and tagged brown rice, carrot, chard, cumin, Fodmap, parsnip, potato, pumpkin.